Ironing hardly seems like a chore when you have a NuTonebuilt-in ironing center. With an ironing center, all your ironing items are within reach in a moment’s notice. No more dragging out the ironing board or clearing a spot to set it up. This unit was designed to fit the iron and standard cord inside on the shelf. If a customer has a larger iron, they can check that it will fit within the dimensions of the shelf 12” x 4.5” x 13”. convenient instant access – NuTone ironing centers keep your board and ironing supplies neatly stored out of the way but right where you need them in a recessed wall cabinet. 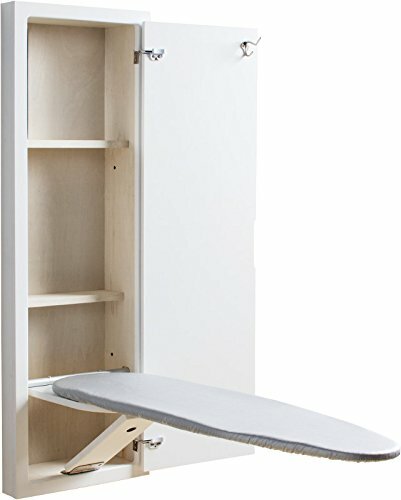 Install your ironing center almost anywhere. If you have any questions about this product by Nutone, contact us by completing and submitting the form below. If you are looking for a specif part number, please include it with your message.